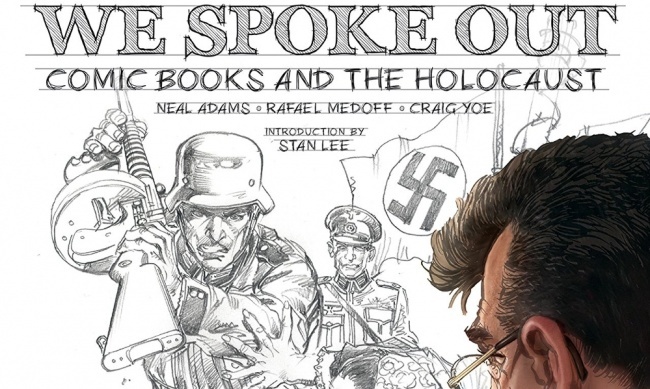 NYCC 2018: How comics broke culture's silence on the Holocaust, with Neal Adams – AiPT! Comic books appeared to be the only form of entertainment in the 1950s and 60s discussing the recent genocide. On Thursday evening, Yoe Books publisher Craig Yoe and historian Dr. Rafael Medoff, the director of the David S. Wyman Institute for Holocaust Studies, joined influential comics artist Neal Adams for a discussion their book We Spoke Out: Comic Books and the Holocaust, which sheds light on the role comic books played to increase awareness among young readers of the 1950s and 60s about the Holocaust, which at the time was taboo. While the panel was deftly moderated by George Gene Gustines of the New York Times, Neal Adams was true to his reputation as one of the most outspoken figures in comics, dominating much of the discussion. After a brief introductory video (following some technical difficulties, which provided a few laughs and levity before the heaviness of the panel began), Adams explained how he discovered comics as a 10-year-old boy Jewish-American boy in Germany while his father was part of the U.S. military’s recovery efforts. This intersected with how he came to learn about the Holocaust, which his parents hadn’t spoken to him about. “I couldn’t speak to my mother for a week,” Adams said of the discovery. In what Adams described as “an underground, stupid way to learn about the Holocaust,” comic books appeared to be the only form of entertainment at the time discussing the recent genocide. This sentiment was echoed by Rafael Medoff, a long-time fan of Adams who credited the artist for being among the many creators who used comics to provide “social justice commentary.” As an example, he referred to Adams’ iconic Green Lantern/Green Arrow run from the early 1970s, written by Denny O’Neil, which tackled political and social issues like racism and drug abuse when the future academic was still a child. He jokingly added that he had to “tip his yarmulke” to Adams for his role in these stories (Medoff was indeed wearing a kippah). Craig Yoe brought the discussion to current events, explaining how he was brought up to believe it’s impolite to talk politics. He said his wife, who’s Italian, comes from a different culture where political discussion is more normalized, but in recent years that’s changed in America too. “We’re like Italians,” he said. As the panel continued, there were a surprising amount of smiles and laughs considering the subject matter, but the message remained clear. Comics helped a generation learn about a tragic injustice that the rest of the culture was afraid to talk about, and they can continue to do so today.